That’s interesting. I tried a Cisco and wasn’t impressed. Do you think I should plug it in for a few days and then connect it up and give it a try again? Do you think I should plug it in for a few days and then connect it up and give it a try again? I finally did buy a Cisco and really like what it does. Michaelb,…Yes,it can be a good idea,…after 4-5 days it tends to have stabilized itself. If you do not live in the UK,also remember to get the electrical phase in the right place when installing your Cisco WS-C2960-8TC-L. There has been a malfunction of some Cisco WS-C2960-8TC-L on delivery. It can also be a reason why you did not experience your Cisco positively. Also check how old your Cisco WS-C2960-8TC-L is,…is it from 2007 so it can be in need of a recapp of the SMPS-card. We have had to do this on two Cisco WS-C2960-8TC-L. I usually give the advice to buy a model as late as possible. They ended up being manufactured 2013. The Cisco also sounds different depending on the surface/feet it is on. These were some points to consider,…more is searchable from the previous forum. check how old your Cisco WS-C2960-8TC-L is,…is it from 2007 so it can be in need of a recapp of the SMPS-card. I cannnot find a date written on mine, among all the various numbers and barcodes. A few characters have been intentionally smeared out, presumably to remove the identity of the previous (corporate) user. I cannnot find a date written on mine, among all the various numbers and barcodes. JimDog,…It was weird,it used to be a white label (1 • 4cm) back on,…or under the Cisco 2960. Attach an internal image to the Cisco WS-C2960-8TC-L,the SMPS-card you see at the bottom left. Of course powersupplies can be swapped out as they are modular fail so not really a determiner age… to me the key thing is the software version… that will tell you how old the build is…and that can be updated if you have access to the software via support/warranty etc. But if the switch is running and not malfunctioning the age is going to be almost certainly irrelevant. If it is malfunctioning, it’s doing it in a way that sounds rather good! Thanks Peder - I haven’t opened the switch up. I will relax about the date of manufacture for now, and enjoy the changed soundscape. Looking on the old and new Forums, it seems that - although the majority of people are very positive about what the switch does - a small fraction of people do not prefer what the switch does to the sound. This is perfectly legitimate as the soundscape is changed in a number of quite dramatic ways, which for various reasons might or might not be to an individual’s liking. It is not a case where it ‘just is clearly better in every way’. the first one i bought, used and refurbished, was a bit edgy sounding. The new one i have now sounds more natural and free flowing. Give us then the information here,…Practical guidance and information. But earlier on the old forum,you have written that version V01, V02 as well as V03 have no meaning for what we want…Namely, better soundquality. Have you now come to a different conclusion,… Please notify us of that information. As for the hardware (Cisco WS-C2960-8TC-L), I have to say that I read your post with great surprise. Do you have the experience of having made a recapp on a Cisco WS-C2960-8TC-L SMPS-card.?? Or having constructed a Linear Power Supply to Cisco WS-C2960-8TC-L.??.. When you pronounce yourself like this.?? We have,…And it is a great audible musical enhancement. Think I can read between the lines of what you write,…A small “pat on the head”. I do not like that,…. We test everything,…and know what we get for results in our music-systems…and that I am reporting about here. 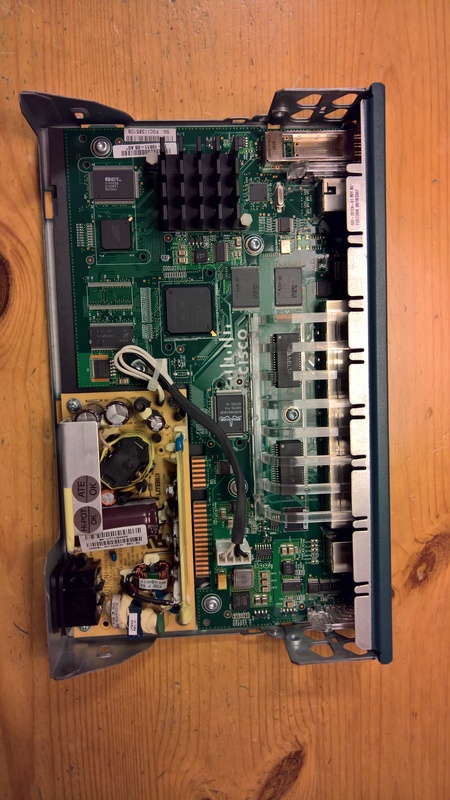 Here you have wrong,…read my reply above about making a recapp on the SMPS-card,…or replacing it with a specially designed Linear Power Supply for your Cisco WS-C2960-8TC-L.
We buy our Cisco WS-C2960-8TC-L from a firm that tests every Cisco in a 26-step test program, not everyone can handle the testing program… even though they work and can be used,they are discarded. Some in our group have bought their Cisco WS-C2960-8TC-L on ebay, these are the Cisco that we have had to do a recapp on the SMPS-card on. The switch to a Linear Power Supply,is done only for upgrade purposes. JimDog,…If you open the lid of your Cisco, there may be a small label with years in the top right corner as well…see my previously added image. One screw on each short side, one on top…then lift the lid on the front edge and fold it upwards, backwards. Consider static electrocuted,…Do not touch anything in your Cisco. AND…Unplug the power cord before doing this. If you open the lid of your Cisco, there may be a small label with years in the top right corner as well…see my previously added image. I’ll have a look and see if there’s a date in there when I get a chance. Simon, as Peder, i am surprised to read from you now that cisco 3560 x r can sound better vs the 2960. You wrote in the old forum that you have listened to different catalyst switches , both 2960, 3560, poe or not…and that the sound didn’t change. Have you found something new since ? JimDog,…Because you experience a big Soundquality raise,…so play music and enjoy instead . But it can be good for the future,to know what year your Cisco is from. But as I said,…the musical result is the most important thing. You might find this none too technical guide helpful… but updating Naim firmware is a zillion times easier unless you can find a buddy who does this for a living. BTW I was laughing because if your powersupply module fails it’s usually better to replace the module than discretely try to swap out specific components, unless you know specifically what has failed. BTW I don’t recommend replacing powersupplies to what is specifically designed, you may well push the device outside of its EM noise compliance due to the additional EM noise you could well be creating. If you like the addition of digital noise in your audio, I suggest there may be better and more compliant ways of doing it. If you want to try a different powersupply then the CR2300 is specifically designed to provide redundancy and provides the correct +12 volt and -52 volts DC. Internally anyway DC to DC converters ( a DC version of a switch mode powersupply) are often used to create the correct voltages… such as if you were powering via PoE. Power supply is built in so all you need is a kettle lead. I read on the old Forum that one should not use a 3rd leg of a Graham’s Hydra to plug in a switch. There was at least one report of that working out ok for someone. I use a spare Grahams Hydra tail to connect my Cisco 2960 - no downside that I can hear. Or if you can power the switch via PoE, so the powersupply and mains is some distance away from the switch in a different room etc. Does the power come from a n external Cisco power supply plugged into elsewhere? You can power your 2960 switch with another PoE capable switch.